CleanSearch® is the Original and premier search engine results management source. Our proprietary name reputation process is registered VIA the United States Patent and Trademark Office. We have formulated a methodology designed to eliminate the occurrence of unwanted search engine results. Our goal is to convince the search engines that there is much more relevant content associated with your [name search] than what is currently being displayed. 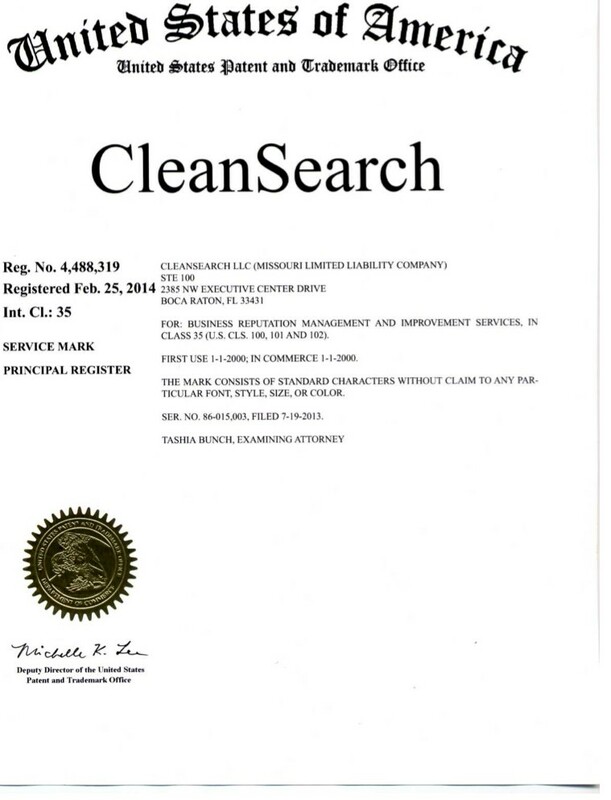 We do this in part by identifying the "Undesired Content", identifying the relevant "Search Terms" and identifying relevant content you choose to be associated with, such as name variations, locations, associations, professional, etc..
CleanSearch® is driven to protect your name, stopping and reversing monetary and strategic losses. We provide our clients with a productive clean atmosphere in which to reside, work and prosper on the world wide web. We solve your issue in the shortest time-frame possible. We offer much more than a series of tasks created on your behalf. We never ask our clients to 'write articles' or 'build profiles'. We handle 100% of the content, processes and work involved in executing a successful campaign. CleanSearch® represents you as an attorney or agent would, personalizing a successful strategy to immediately clean-up the search results related to your name or business. CleanSearch® is the #1 Reputation firm. Online since 1999, we possess the knowledge, applications, and resources that other firms cannot match. Clean Search is the industry leader in Search Engine Image Protection & Search Engine Reputation Management. We can hide, obfuscate, edit, or remove unwanted internet content, by eliminating the related listings which appear in close proximity to your name. As you know, negative content which is accessible to the public via search engines, can make or break a reputation. Especially when your career or business is jeopardized. This type of negative publicity can proliferate and become permanently associated with you. This is undoubtedly costing your business or deteriorating your social status and in some cases your livelihood. Interested parties, disgruntled patrons, patients, employees and clients, can find and exploit your negative listings, making an already bad situation worse. Personal grievances can spiral out of control with horrendous consequences. We have executed campaigns-to-success beyond what other reputation firms have ever conceived possible. The complexity of a successful case can wind through a vast network of internet and social facilities, CleanSearch® has the infrastructure and expertise to succeed. We have every conceivable facet of online reputation management, investigations, leveraging, etc. needed to empower our clientele. Regardless of what it takes to achieve success. Our results are PERMANENT and RULE COMPLIANT as accepted by Google.com and other major search utilities, giving our results stability and longevity in perpetuity. Clean-Search helps associate what Google deems relevant to your name, thus altering the rendered listings. If you are attempting to determine just how to create positive search results, you are not alone. Clean-Search can save you time and money as well as create energy, by managing your name relevancy.